Pakistan Navy Civilian Jobs 2019 Apply online from here. 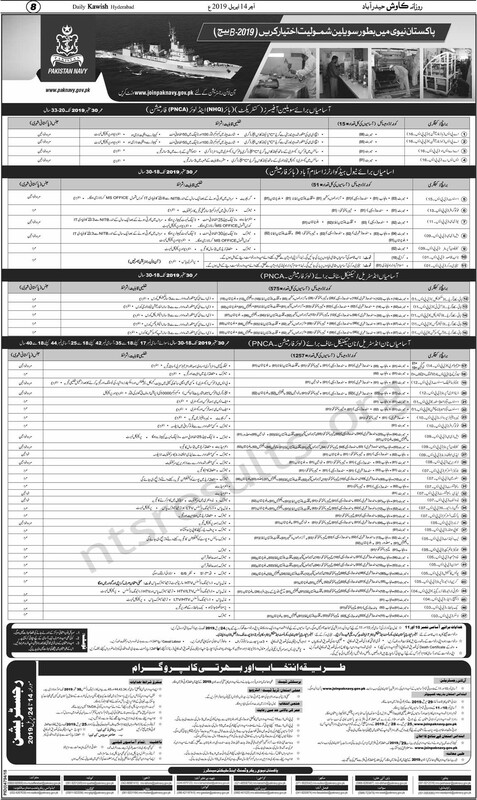 Last date of register yourself for Navy jobs of Pakistan is from 14th to 24th April 2019. The Pakistan Navy is the naval warfare uniform service branch of the Pakistan Armed Forces. It came into its modern existence from the Royal Indian Navy that ceased to exist following the partition of British India through a parliamentary act that established the independence of Pakistan from the United Kingdom on 14 August 1947. The foremost mission as well as objective of Pak Navy is to ensure the defense of sealines of communications of Pakistan and safeguarding the maritime interests by executing national policies through the exercise of military effect, diplomatic and humanitarian activities in support of these objectives. Male and female can apply for Navy civilian jobs. All those candidates who have the require qualification and skills and are eligible for the Navy Civilian Jobs must apply to grab this golden opportunity. Applying procedure as well as other requirements for the Pakistan Navy jobs as civilian are mention below. How to Apply For Pakistan Navy Civilian Jobs 2019 Apply online? You can register your self online from 14th April 2019 to 24th April 2019. Selected candidates can be posted in Islamabad, Karachi or any where in Pakistan. Last date to apply online is Wednesday, 24th April, 2019.